Poets & Writers, the nation’s largest nonprofit organization serving creative writers, invites Alabamian writers to apply for the 2014 Maureen Egen Writers Exchange Award. Each year, Poets & Writers invites poets and fiction writers from a selected state to apply for the award. This year, those who are residents of Alabama are eligible, provided that they have published no more than one full-length book in the genre in which they are applying. The judges for 2014 are Victor LaValle for fiction and Evie Shockley for poetry. One winner in each category will receive an all-expenses-paid trip to New York City to meet with top literary professionals, including editors, agents, publishers, and prominent writers. While in New York, winners will also give a reading hosted by Poets & Writers. In addition, each winner is invited to spend a month at the Jentel Artist Residency Program in Banner, Wyoming. The prestigious award, which aims to provide promising writers a network for professional advancement, has helped to launch the careers of Sue Monk Kidd (The Secret Life of Bees), Elaine Beale (Another Life Altogether), Sandra Beasley (Don't Kill the Birthday Girl), David Mura (Turning Japanese: Memoirs of a Sansei), Fae Myenne Ng (Bone), Mona Simpson (My Hollywood), and others. Since Poets & Writers began the Writers Exchange in 1984, eighty-five writers from thirty-three states and the District of Columbia have been selected to participate. The award is generously supported by Maureen Egen, a member of the Poets & Writers Board of Directors and retired as Deputy Chairman and Publisher of Hachette Book Group USA. Entries must be postmarked by December 1, 2013. Download the guidelines and application. Victor LaValle is the author of the short story collection Slapboxing with Jesus (1999); three novels: The Ecstatic (2012), Big Machine (2009), and The Devil in Silver (2012); and a novella, Lucretia and the Kroons (2012), available as an e-book. He has been the recipient of numerous awards including a Whiting Writers’ Award, a United States Artists Ford Fellowship, a Guggenheim Fellowship, and the key to Southeast Queens. He teaches at Columbia University. Poet Evie Shockley earned a BA at Northwestern University, a JD at the University of Michigan, and a PhD in English literature at Duke University. She is the author of several poetry collections, including a half-red sea (2006) and the new black (2011), and of the critical volume Renegade Poetics: Black Aesthetics and Formal Innovation in African American Poetry (2011). Her honors include the Holmes National Poetry Prize, a Hurston/Wright Legacy Award in Poetry, and fellowships from Cave Canem, the Millay Colony for the Arts, the American Council of Learned Societies, and the Schomburg Center for Research in Black Culture of the New York Public Library. She is a professor at Rutgers University. Founded in 1970, Poets & Writers’ work is rooted in the belief that literature is vital to sustaining a vibrant culture. 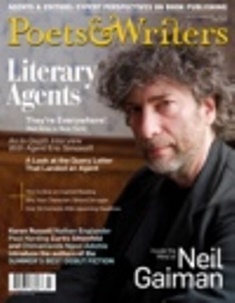 We focus on nurturing literature’s source: creative writers. Our mission is to foster the professional development of poets and writers, to promote communication throughout the literary community, and to help create an environment in which literature can be appreciated by the widest possible public. Learn more at Poets & Writers.